Remember the Good Times: Card Share: What's Cookin' at the Swifts? Hi everyone! Today I'm sharing a card showcasing Echo Park's new Simple Life collection and two Echo Park Silhouette files — one a print and cut file (apron and oven mitt), the other a standard cut file (notebook paper). For details on how this card came together, and tips for printing on cut files (I added lines and text to the notebook paper), please visit the Echo Park blog. That is so cute. 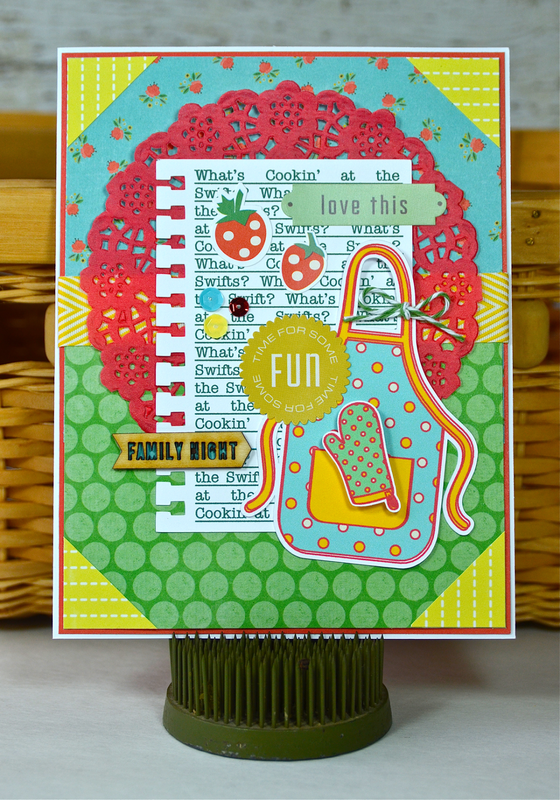 Love the bright colors and red doily! This is gorgeous!! Off to see more!!!!! Super cute, Lisa, love the colors and that fun apron and mitt! Cute apron and fun card!! Such a darling card, Lisa. Love the print file:):) super cute Card Lisa!!! Love this card - those yellow triangles anchored in each corner just add so much!! Love the red doily and the addition of your 3 perfectly placed sequins!! And the added touch of a twine bow on the neck of the apron adds such a great touch!!! Love it!! The notebook page is a very good idea, Lisa ! Such a nice card ! This is really cute Lisa, and I love your second card on the EP Blog!! So fun!!! Love that apron and the bright colors!!! Such a fun and colorful card! And the baker's twine adds such a wonderful touch!